The long-awaited SLink Mesh Hands have arrived! These hands are so beautiful, I probably won’t ever take them off. Finally, my avatar can express herself with over a dozen hand gestures, instead of being limited to the few default ones from SL. The hands are rigged mesh, so you won’t need to resize or adjust them in any way for a perfect fit. 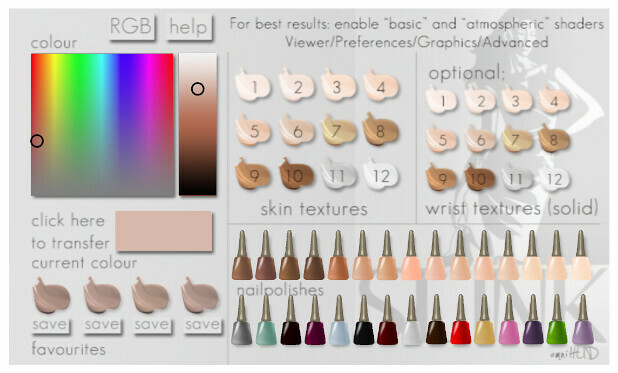 Included in the package is a HUD to tint skin tone, a nails HUD, and 15 pairs of hands with different gestures. I like to mix-and-match the hands to fit whatever pose I’m using. SLers have always complained about ugly hands and feet, and now that we’ve had pretty mesh feet for a while, it’s time to update with mesh hands too! Check ’em out at SLink. I wear the same skin and shade as you… Is there any chance you’d be nice enough to post your color settings for the hands? You did such a wonderful job matching them! Pretty please? the hand-wrist ratio is a little off. The hands are pretty, but too small and that makes the forearms (especially the wrists) look short and chubby. I hope they make those hands with claws though. I can live with chubby arms, if they have claws at the end ;D.
Have you heard of Yabusaka’s mesh hands? Apparently he gives skinshops permission to texture and sell them with their skins (the feet too, but slink’s look much better) . This shop is the first who uses them, but i hope others will follow soon. I like the pointed nails manicure on one of the yabusaka hands, and I liked that it was rigged when that was the only option out there. But I never go a pair because there was no gray skin texture and that’s what I needed to match fantasy skins. @Shuri, if the hands are too small, you can resize them through the SL shape settings, they just resize like the SL hands do. Um, honestly love the look of the hands, but I was so distracted by the “regular” hand shadow that they overtook the hands itself for me. I usually really like your posts but for this one maybe a better pose would have been better for showing them off. I can’t really help the default hand shadow, that’s just an SL glitch, the same way wearing a short system skirt creates a massive system skirt shadow, too. That’s totally what I was thinking. *Sighs* Oh how that glitch could be fixed. Would make the hands rock out loud on that one haha. I so love these hands, I’m not sure I’m going to take them off. My only complaint is that the texturing is slightly different from the skin I wear, but it’s such a minor, subtle difference that I can’t say I much care! I had the same problem with Slink, El. I do not have any problems with Maitreya and dream of the day they will release feet in mesh. Or maybe hands for the matter. Their notecard with color tones for the many skins on the grid is most precise. I have to say, the hands look lovely, but editing them is a nightmare, that’s a few hours of my life I will never get back. I have the Slink feet and never had this much difficulty getting a match, for some reason every blender layer I try is just white when I go to edit it to try and get the correct shade as per the notecard…..throws her now non mesh hands up in the air! I have exactly the same issue… I tried the demo, and all the blender layers were either white, or a weird dark green/brown. I’m going to keep trying, but I’m wary of buying them until I know I can get a match at least for one of my most-worn tones. Then, hey, I’ll just never change it! Well, after multiple cups of coffee, a few chocolates and more coffee, I finally got them sorted out, I still don’t know why the blender layers were all white instead of one of the coloured skin tones, it took a bit to get the blender layer right because of that. They are lovely hands, but just took some time and effort to get there. I am glad I persisted with them even though I was thoroughly frustrated….gives a thumbs up on her new mesh hands. I tried the hands on, and they were great. I found it quite easy to texture with my skin (I was wearing Glam Affair Europe tone). I haven’t tried to match the other skins I wear (League Pale and LAQ milky). The concern I have is one that is not the creator’s fault. In order for the hands to look good, you always have to have atmospheric shaders on (The notecard makes it very clear to be sure to enable atmospheric shaders). That’s perfectly fine, if you have a newer graphics card and SL runs well on your machine. In most situations I can leave atmospheric shaders on, but sometimes not. When atmospheric shaders is off, you can see the wrist line and the colors are off. I also have the same problem with some shoes with either prim or mesh feet. I have the hands (and mesh feet) and they are totally amazing. It’s beyond me how anyone would have problems tinting them, it took me 2 mins. Sidd, you are the best! Same here, I’ve demo’d/tried everything and SLink is the easiest to work with. I’m wearing Kumi Vanilla – Defined, and (following the SLink instructions for the hands), I found the RGB that worked was R240, G208, B193. That’s the settings for the blend layer, which you then enter for the hands (again, following the instructions). I found that turning on Atmospheric shaders (which I’m generally not crazy over) gives the hands a flawless look. I usually run with AnaLutetia AvatarOptimal as my ‘fixed sky’ environment setting, too. Mine are almost 100% flawless and only someone really scrutinizing them notice the faint lines. Does anyone know which hands are included in which packages? I can’t seem to find this information anywhere.